What living things on Earth have been in existence the longest? I don’t mean which individual animal or plant has lived the longest, such as species of coral or sponge that are known to have been living upwards of 2,000 years, or terrestrial animals such as tortoise that have lived for over 150 years. Nor plants such as the bristlecone pine from North America, one of which is 5,062 years old (measured by ring count), nor the Llangernyw Yew in the churchyard of the village of Llangernyw in North Wales, one of the oldest individuals tree in the world, and believed to be aged between 4,000 years and 5,000 years old. I mean what life forms have been in existence the longest and are still living today? The answer is Stromatolites (or stromatoliths). These are rare rock-like structures found in just a few hypersaline lakes and marine environments around the world, and which, from the fossil record, are known to have been in existence for some 3.5 billion years. They existed in abundance after the earth had been formed when there were no animals or plants. Because they were prodigious photosynthesizers, their waste product, oxygen, entered the atmosphere in great quantities, making the earth suitable for other forms of life. Over time, organisms developed that grazed on stromatolites, and by the end of the Pre-Cambrian Period (about 570 million years ago), they numbered only 20% of their peak. Stromatolites are created by the accumulation of photosynthesizing cyanobacteria (often incorrectly called blue-green algae). These bacteria are prokaryotic bacteria, and are neither algae nor plant. 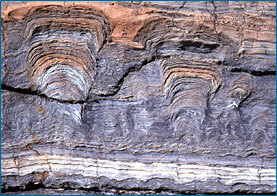 When they colonize to form a stromatolite, they number some 3 billion organisms per square metre. The bacteria secrets a mucus coating that traps sediment, and calcium carbonate precipitates from the water providing a hard, cement-like material to fuse the sediment together. New cyanobacteria grow over the sediment and over time a rock-like structure is formed. 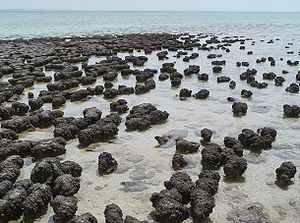 Scientists had long known about stromatolites from the fossil record, but were surprised to find them still in existence, when they were discovered in 1956 at Shark Bay, Western Australia (now the Hamelin Pool Marine Nature Reserve). Other places where stromatolites are found are Lagoa Salgada, Rio Grande do Norte in Brazil and two inland sites in Mexico at Cuatro Cienegas and Lake Alchichica. Unexpectedly, there is one marine site that is not hypersaline, Exuma Cays in the Bahamas. And according to the BBC, a very young colony of stromatolites, just a single layer thick, was found at the Giant’s Causeway in Northern Ireland in 2011.